Etched Elegance clear plastic glasses and mugs feature a triple wave design adorning their surface. With this collection you can get the opulent look of crystal stemware and the cost efficiency of plastic tableware in one package. including plastic wine glasses, plastic champagne flutes, plastic tumblers, plastic martini glasses and more. The elegant embossing and the solid plastic construction of these clear plastic drinking glasses is sure to make a splash at your next party. 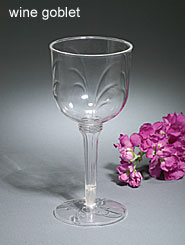 Elegance Etched Wine Glass 5 oz. 24ct. 8oz. Elegance Clear Plastic Cafe Mug 40ct. 40ct. Sturdy handle, sits on wide footed base. Used for hot and cold. White Etched Elegance Plastic 8oz. Mugs 40ct. These classy and tasteful coffee mugs are a great deal. They feature an etched design on the border for a refined look, and they superbly priced for a great choice at any sized event.